The big problem with the relative lack of philosophical attention given to qualitative individualism is that the ideal has had relatively powerful defences. Its most explicit defenders have been existentialists like Sartre, but Sartre’s best-known defence, at least, seems to fall flat. Charles Taylor has done the most to articulate the idea and how and it makes internal sense, but for the most part he is very cautious about ever actually endorsing it. Sometimes his defence of it seems to be simply on historicist grounds, as I quoted him in my first post on the subject. That is: qualitative individualism happens to be what we believe in the educated 21st-century West, and it is just for that reason important to us. Western governments therefore need to respect it just as the governments of Turkey or Indonesia need to respect Islam. Beyond politics, it is among our assumed starting points for inquiry, such that philosophically it is important to think with it (even if in the end we come to find it untenable). This point does matter. Why give Cthulhu a happy ending? A few years ago, Skholiast wrote a lovely post on the philosophical significance of J.R.R. Tolkien and H.P. Lovecraft, two early 20th-century writers who shaped the genres we now call fantasy and horror, respectively. I was reminded of it this year at an enjoyable AAR panel entitled “Cthulhu’s Many Tentacles”. Cthulhu, of course, is the best-known character (if that is the word) from Lovecraft’s stories, enough that the fictional pantheon he created has become known as the “Cthulhu Mythos”. 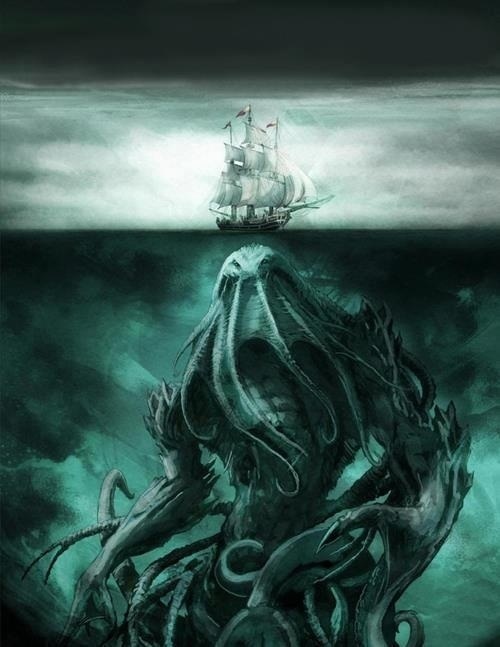 Cthulhu is one of a set of “Elder Gods”: horrifying, vaguely amorphous, often tentacled monstrosities that have lain dormant for millennia and will soon devour humanity; their horror is such that the mere knowledge of them could drive one mad. The AAR panel gave recognition to many aspects of Lovecraft’s work: starting with a presentation on the man and his work itself, the presenters proceeded to examine the varied dimensions of the fandom that has grown up around Lovecraft (noting, in particular, that fan creativity has been greatly enabled by Lovecraft’s work rising into the public domain). In scholarship on Karl Marx it is a commonplace to draw a distinction between the “early Marx” or “young Marx” on one hand, and the “late Marx” (or “mature Marx”) on the other. There is considerable debate about whether Marx changed his opinions from the early phase or the late phase; many argue that they were constant. But there is little doubt that he changed his emphasis. The young Marx – the Marx of the Paris Manuscripts and Contribution to the Critique of Hegel’s Philosophy of Right – writes a great deal about Hegelian philosophy and the criticism of “religion”. For whatever reason, the late Marx – the Marx of Capital – largely leaves that topic behind, at least in what he says explicitly. He turns his attention instead to economics and politics, to the details of capitalism’s functioning. One of the most fundamental things a philosopher does is to ask why. When someone says “you should do x” or “y is good,” it seems to me, the true lover of wisdom needs to ask why this is the case. If someone tells me I should do something and can’t provide a reason, I see this as grounds for questioning whether it really is something I should do at all. Nietzsche, if he does nothing else, shows us that the things we take as obvious may well not be so. The posts of the previous couple weeks begin to add up to an argument for the existence of something like God – a value or goodness that is an inextricable part of the basic structure of reality. It strikes me that a significant part of this line of reasoning also underlies most of the widely known philosophical proofs for the existence of God. These proofs (at least on their own) do not take us to any of the particular Abrahamic views of God, as revealed in Qur’an or Torah or the person of Jesus Christ, but they are often taken as a first step to getting there.